I have less than a week before I've got to go to Tucson. Time is running out. I've been scuttling around, trying to get as much done as possible before I have to go. Sometimes I wish that I could just make time stop – make it stand still as stone. I realize that as I ponder this... more moments have slipped through my fingers. The slow, steady fall of sand in the hourglass continues ever on. Unfortunately there won't be a Thursday Giveaway this week. I had planned a big one to ring in the New Year, but it doesn't look like it's going to happen this week. My apologizes. It's worth the wait though. I would write more, but there is just so much to do and not much time to do it in. I had an idea for an art project. It's a fast one that's time sensitive. I need 100 volunteers who have a digital camera or access to one. Participants should be able to take a picture and be able to email it to me. For more details and to sign up, email me (ardenttie@yahoo.com). Include your name and email address in an email with a subject line of "Secret Art Project". Or leave a comment to this blog post with your email address. I'll reply back with instructions. UPDATE: The signs up for this project are now closed. Thank you for everyone who participated. I will post everything once it's finished. 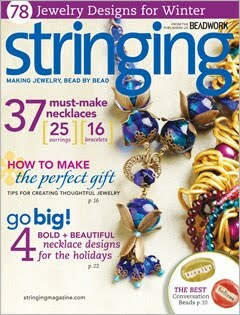 The winter issue of Stringing magazine just came out and it's a thing of beauty. It's full of art beads and helpful resources. 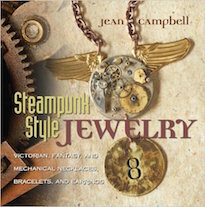 There are so many inspirational designs; I'm particularly fond of the Steampunk-inspired pieces and the ones featuring jewel-toned components. CLICK HERE to check it out. 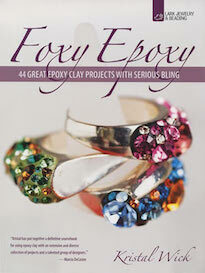 Be on the look out for a couple of my bracelet and earring designs that are featured in the magazine. 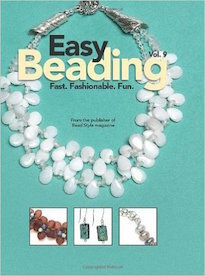 Another fun magazine that's out now, full of prize-winning designs is Bead Star! This year's Grand Prize winner is Erin Strother. 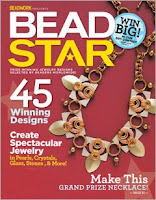 CLICK HERE to check out an entertaining exclusive interview Erin had with fellow Bead Star winner, Denise Yezbak Moore. To find out more about the magazine and to get your own copy, CLICK HERE. I was fortunate enough to land 3rd place in the crystal category with a piece called, "Breaking Dawn". The winner for this past week's Thursday Giveaway featuring goodies from SueBeads is Hope Smitherman of Crafty Hope. Congrats! Send me your address and I'll pop it in the post! Be on the look on Thursday for another chance to win! The past few days have been really nice – lots of feasting and family time. Paulo and Babette were entertaining company with their good looks and playfulness. 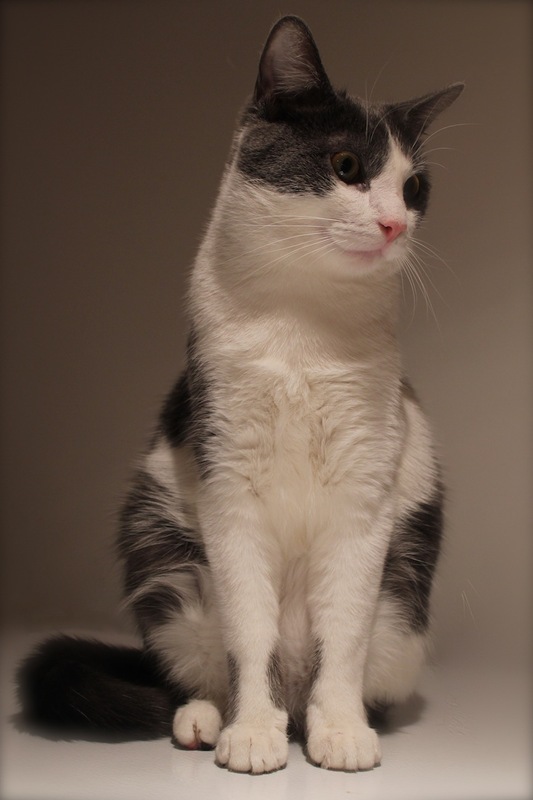 Paulo was particularly fond of Sheila and even jumped up in her lap and gave her a nuzzle and hug. Very cute! I didn't take as many pictures as I had intended. I got caught up cooking and catching up and telling stories. Now that everyone is gone and the house is quiet, I'm a little blue. Admittedly, there is so much to do before Tucson that there really isn't much time to be sullen. Also, with the New Year's Eve party right around the corner, there's promise of even more entertaining moments to be had. This year the menu will consist of my spin on traditional lucky foods. I've got lots of delicious dishes planned out. (I'll have to find a deep fryer for one of them. So you know it'll be good!) I'm also building a playlist of appropriate songs for the get together. Any suggestions? I've found a lot of goodies on the new Pink Martini album. Their multi-traditional, non-denominational approach to a holiday record has been really helpful and pairs well with the theme of the menu. Below is video of them on the Jay Leno show performing "We Three Kings". 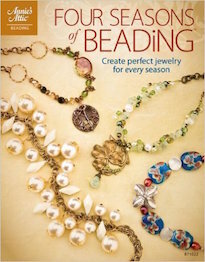 Lisa has received permission to share a project from her book, A Bead in Time! This necklace, using softflex wire, was inspired by a colored pencil drawing! Tammy looks at least year's resolutions and thinks about 2011. Share your resolutions or lack of them. Come make a sleigh bell bracelet with ABS for the 6th Day of the annual 12 Days of free projects! Carmi starts to work with resin cubes she made earlier in the year. Cindy shares the key to her designs. Melanie gets in the Christmas spirit with a holiday song to inspire three fun projects. Come on over and get the shopping list for the next Blog Reader Challenge! Jean makes some holiday themed jewelry for Rings & Things! The time flew by as she made these pretty creations! Sue Kennedy of SueBeads offers up a really beautiful assortment of goodies in this week's Thursday Giveaway! Find out how you can win them! Hope everyone is having a wonderful Christmas with their friends and family if they celebrate. Much to be thankful for this year! Merry Christmas! Happy Yule! Bright blessings! Happy holidays! I've been sorting and pressing, organizing and cleaning. I've been cooking and mopping, clipping and editing. I've been uploading, unpacking, wrapping, and stacking. I've been deleting and backing up and printing and sifting. I've been scrubbing and wiping and freezing and dicing. I've been drying and washing, washing and drying. I've been decorating, un-decorating and re-decorating. I've been doing all this, but not exactly in this order. I'm tired and exhausted and about to pass out, but not nearly finished. I've still got a teetering stack of things to do and not much time to do it in. Before I leave for Tucson, I'd like to have my studio organized. It's really important for me to sort of know where everything is. And while there are some vast improvements, there are still a few piles and boxes that must be sorted through. Sounds easy enough, right? Well, there are boxes with hundreds of papers that have to be meticulously combed through and filed. Bins of beads thousands heavy that need sorting and so many half-finished projects that need to be finished. If only I didn't need to sleep for those days remaining and still be functional. This week, one lucky winner will claim an assortment of goodies courtesy of Sue Kennedy of SueBeads. She has generously put together a grouping of enameled beads and components, lampwork glass beads, and dark emerald "sugar" beads. 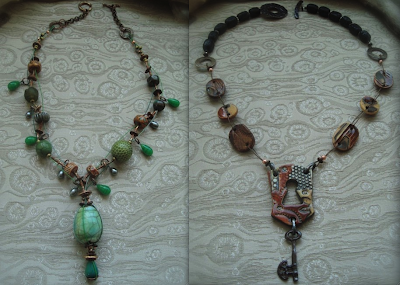 She has even included two of her highly popular Hilton Head beads! I really love the funky, vibrant mix of oranges, greens, and pale blues that she's included for this week's prize. For a full selection of Sue's beads, swing by her website or check out her Etsy shop. CLICK HERE to visit her blog to get the behind-the-scenes look at the artist and her work. 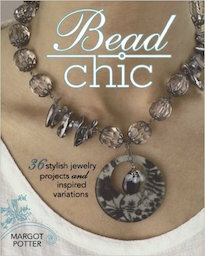 You could easily be the winner of the bead spread shown above and score yourself a belated holiday present. All you have to do is leave a comment on this blog post. One lucky winner will be randomly selected from the comment section of this blog post on Monday (December 27th) at midnight EST. Make sure to leave your name if it doesn't already appear next to your comment for easy verification! This giveaway is open to all participants, including international readers. Extra Bonus Points: Do you really want to win? Take a visit to Sue's WEBSITE or her Etsy Shop and have a look around. Report back here with what your favorite thing she makes is in a separate comment for an additional chance of winning. CLICK HERE to go to her website. CLICK HERE to go to her Etsy Shop. The winner for this past week's Thursday Giveaway featuring lucite goodies from The Hole Bead Shoppe is Rose Binoya of Ahtee's Blog. Congratulations! Send me your address and I'll pop your prize in the post! Be on the look on Thursday for another chance to win! Earlier this year, I had the pleasure of meeting with Jen Palmer of Aisling Photography. She lived just over the bridge and it was delightful to meet another creative type so close. (She has since relocated to Savannah, but still comes up fairly frequently.) She is a photographer of such immense skill. I love her dreamy, yet edgy photographs. She has a talent for capturing a little bit of magic in her images. Before she left, she hosted "The Piano Sessions". She moved her grandmother's antique piano out to the middle of a clearing in a field and had subjects pose with it. I was fortunate to participate. It was a wonderful experience! Below are some of my favorites. The photos are all by Jen Palmer of Aisling Photography and come courtesy of her. CLICK HERE to see more examples of her work. I really love how these photographs turned out. The polished wood of the piano was an excellent backdrop. 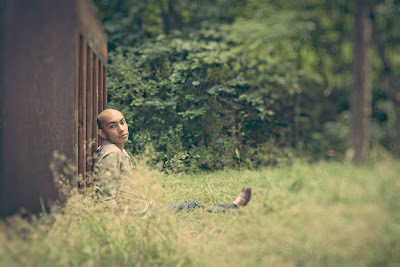 Not only that, but the grassy greens were so lush. I loved working with Jen, because she wasn't afraid to collaborate. She knew that I am a jewelry designer and was nice enough to take some "product shots". The above necklace spots a beautiful kyanite point, a hand-stamped charm from Heather Wynn-Millican, and a fine pewter pendant from my family. 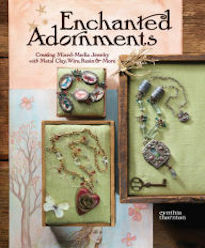 The charm from Heather Wynn-Millican has a Pablo Picasso quote that says, "Art is a jealous mistress." 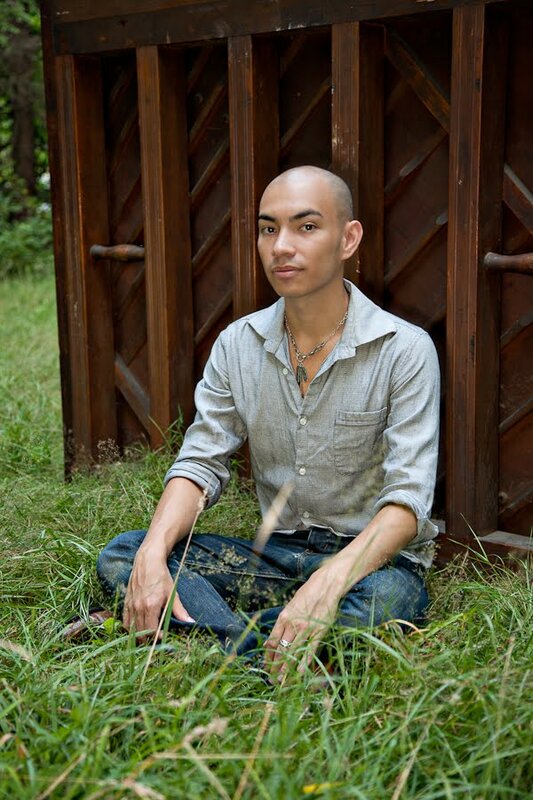 The feather pendant from my family says, "To thine own self be true." 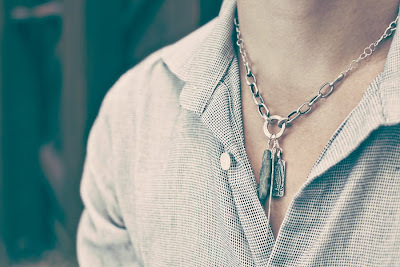 Hung on graduated chains – it's simple, but works. 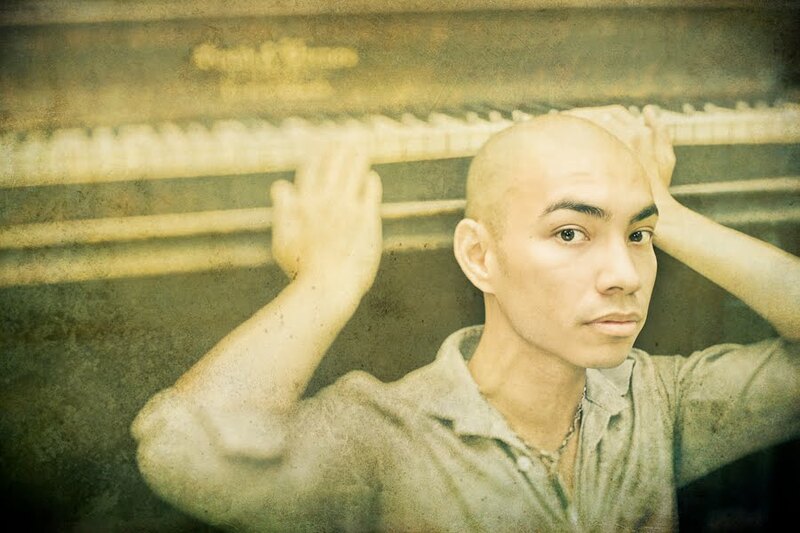 Since I have no musical talent whatsoever, I thought it was good that there were shots where the piano was ambiguous. I've always wanted to learn, but have been hesitant. I think it stems back to a conversation I had with my grandmother. I probably wasn't more than eight. She was sick and in the hospital and a recording of one of relatives with a deep voice was playing. I can't recall his name, but he was performing Amazing Grace. She said to me, "When I die, I want you to play that at my funeral." 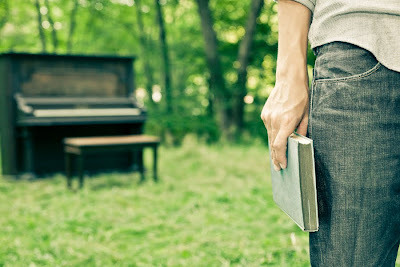 And I told her, "I'm never going to learn to play the piano, because I never want you to die." Fortunately, I was blessed with several more years with my grandma. 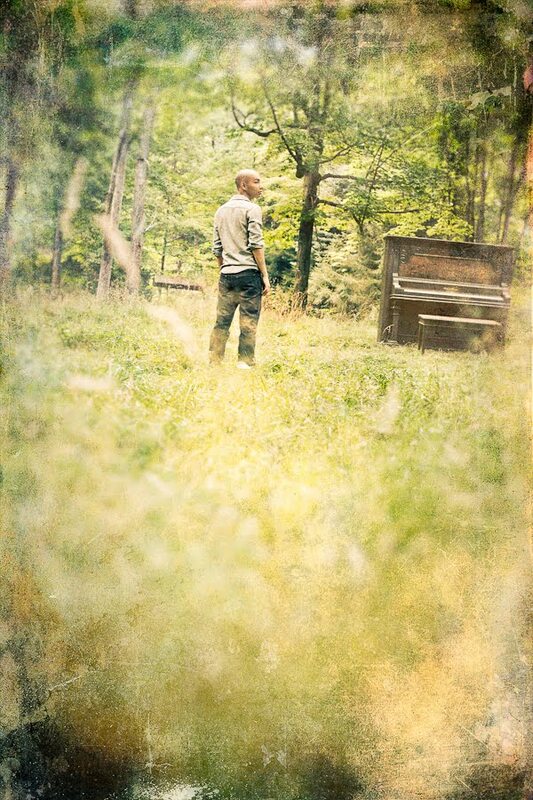 But I never learned to play the piano and I get a shiver every time I hear that song. I love the dreamy effects she uses. I think it goes well with the ambiance of the photographs. I think in the wrong hands these devices can look cheesy or out of place, but I love the way that she uses them to enhance the feeling of the pictures. They seem romantic and slightly ethereal. I think the above shot is one of my favorites. Perhaps it's because at the very heart of it, I am still camera shy and don't particularly like pictures of myself. After my brother left, my parents just stopped taking pictures. There are years without any pictures of me. A random school photo can be found or a blurry photography assignment from one of my sisters, but that's it. When I became an adult, I tried to change this... but still, my heart races a little when a camera's lens is trained on me. I love how the piano seems to have grown up in the middle of the field. It's almost as if it were apart of some kind of woodland celebration amongst otherworldly creatures and I happened to stumble upon it. In the same series, Jen took an image of a girl in a big yellow taffeta skirt sitting on top of the piano. She seemed to be right out of a fairytale. If you get the chance to book Jen Palmer, I highly recommend her. She is easy to work with and makes you feel comfortable. She works with the way your body moves and your natural expressions, so you don't look overly-posed or like a mechanical robot. Her images are very painterly. She also offers printing options that are environmentally friendly and socially conscious. CLICK HERE to read more about her work and her processes on her blog and CLICK HERE to find out more about her work. I hope that everyone has a most excellent Winter Solstice! May the year to come be filled with bright blessings and much abundance! Babette has found her new favorite spot: Under the Christmas Tree. 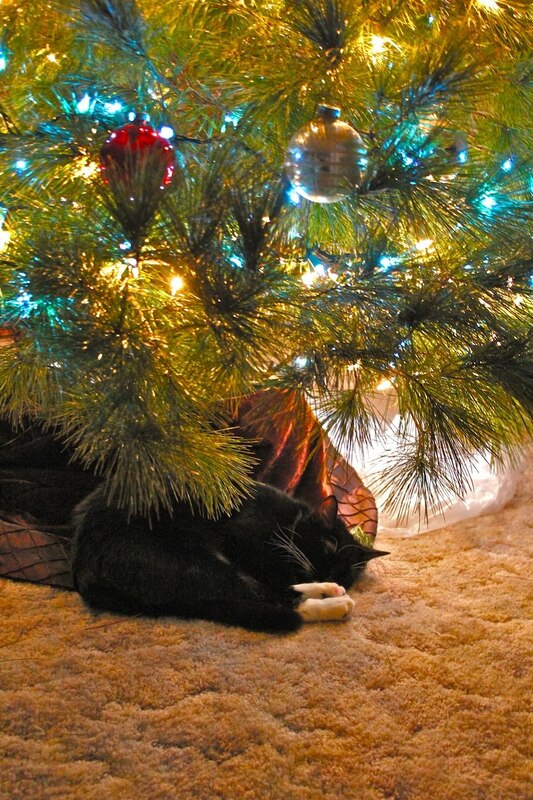 Of course, she does her own decorating by dragging plastic bags and bubble wrap under the tree to cuddle up with. If you are interested in chainmaille, Lisa had the opportunity to host Blue Buddha Boutique's, Rebeca Mojica, as she kicks off her virtual book tour for "Chained". Tammy reviews an innovative new web-based magazines from Interweave. 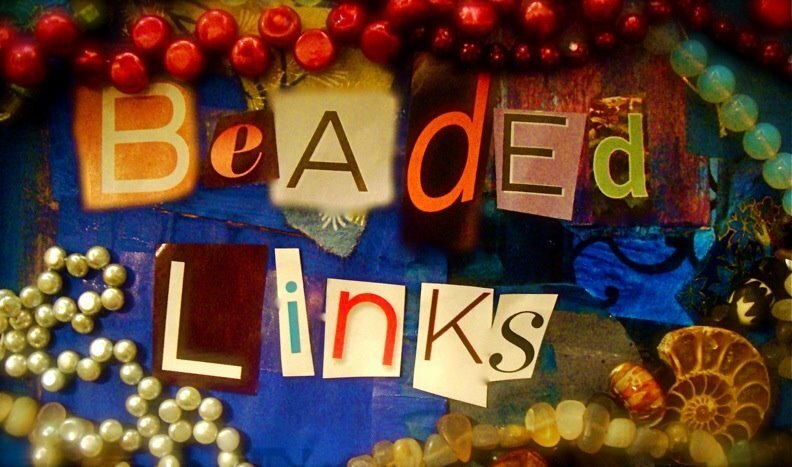 It's the ABS annual Twelve Days of free art bead jewelry projects! Stop by and try out the Jingle Berry Lariat! Michelle shares ideas for beaded napkin rings to decorate your holiday table. Carmis makes a button pin much more attractive with a felted background! 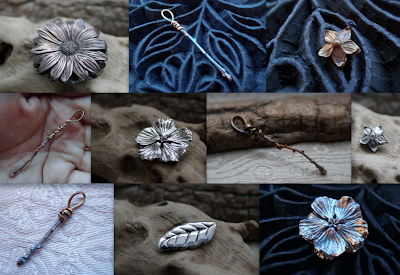 Inspired by the snow on the ground, Cindy created a new ring - the Flurry Flower! Lorelei has moved her bead studio, yet again! 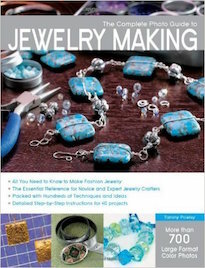 Jean is delighted to present one of her latest book reviews of a remarkable book called 500 Plastic Jewelry Designs. Come and immerse yourself in the fascination of the heights which can be achieved using this medium through the brilliance of a collection of fantastic jewelry designers! 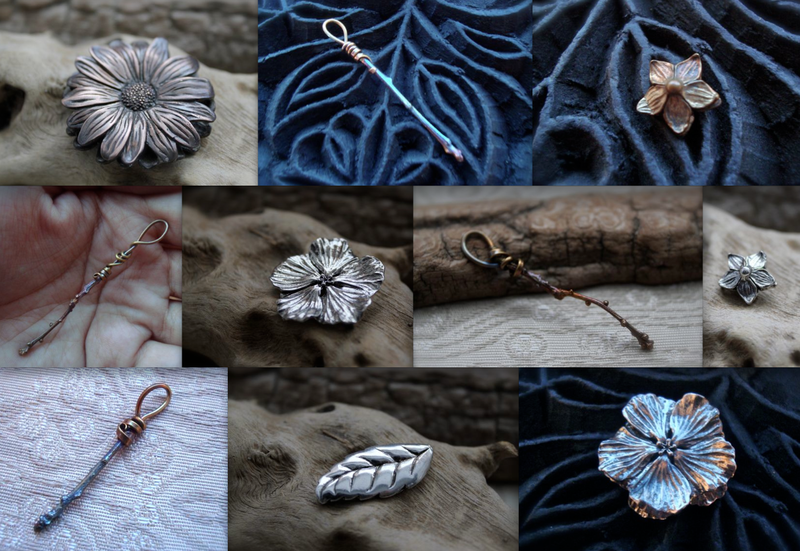 Want to win some luscious lucite components from The Hole Bead Shoppe? Seize your chance in this week's Thursday Giveaway! I love yogurt and I love supporting good causes like Susan G. Komen for the Cure. Currently Yoplait is combining my loves by donating $0.10 for every pink lid returned. Hopefully you've been saving your lids and enjoying LOTS of yogurt. The deadline is fast approaching, so wash them up and ship them out for the lids to count! The deadline is December 31st! CLICK HERE for more information. I missed the postman and had to go into town to go to the post office. As I've mentioned before, I don't normally like to leave the house when it's snowy out. I particularly do not like to drive when there's snow and ice on the ground. But desperate times call for desperate measures. I bundled up in warm, thick layers. I wrapped my head in a scarf and wore a cap and then covered it all up with a hood. I brought out the big Gore-Tex boots and wool socks. I wore insulting long johns and mittens. And it was "warm" today! When I finished up and was heading back inside to the sanctuary of blankets and hot chocolate, I thought... "Hey, I'm already dressed up and it's not too terrible out. I should snag a couple of pictures." Above is a picture of the small marshy pond behind my home. I scattered some sarracenia seeds before the snow and hopefully they'll take up here. Now it is covered over with snow and ice. The cattails look strangely out of the place, bobbing in the wind with no trace of the pond in sight. From the small, shallow covered over pond, I went to the edge of the "cliff". It overlooks the valley below. If you look carefully, you can see the road that leads up to the property, snaking through the barren trees. You can see distant wisps of smoke from a neighbor's fire. I guess I was feeling adventurous, because I hiked my way down the valley to the stream. I've only done this a handful of times in the past when the weather was good, let alone when everything is covered in ice and snow! But the snow made it easier to navigate the more wooded and wild areas. I followed the deer prints, treading carefully. Looking at the prints, I could judge how deep the snow was and was able to avoid things like traps, snow covered ice and treacherous falls. It would be easy to slip in a snow-covered gorge and never be found again. While I followed the prints, I made sure that my brightly colored scarf was prominently displayed. Although hunting is not permitted on the property, I wasn't adventurous enough to tempt the fates. Amongst the scenery of winter white, faded grey and muted brown, little sparks of color could be found – the vibrant green of thawed out mosses and miniature ferns dripping with icicles, the red of wild rose hips, and the green and creams of polypores. I found icy stalagmites rising up from the forest floor around the edge of a rock outcropping, like a wintery row of jagged teeth protecting the sleeping area of some kind of animal already left for the day. That was another thing that I was careful to avoid if possible. The property contains many of these outcroppings, some of them quite large. They are perfect for bears, mountain lions, and hunters to hide. Oh my! I did not expect to be out for hours, wandering around in the icy cold. It's not something that I could have planned for. The sun was glinting off the snow in just the right way and I was sufficiently warm and cozy enough to embark on a totally uncharacteristic venture. 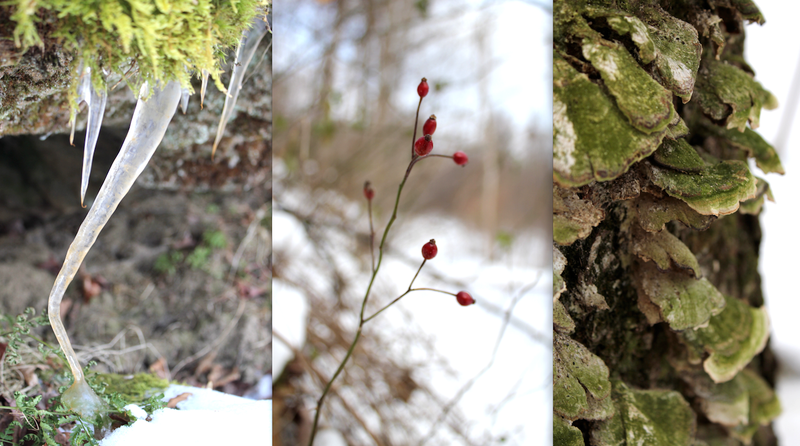 I'm glad though that my explorations of the property now include excursions in all seasons. I like to load down the feeder with seed and suet and watch the birds descend. They are thickest in numbers in the early morning. It is quiet then – save for their calls and cooing and flaps of wings. The big mourning doves and big bluejays usually crowd out the smaller birds, who wait patiently or sneakily swoop in. It boggles my mind just how much work they do to survive. They are constantly hunting and pecking for food and evading being devoured... and yet they accomplish all this gracefully. I think this is how I would like to lead my life: to do much and do so seemingly effortlessly and full of grace. Usually I feel so clumsy and crude. To me, it feels like all my efforts come across a labored and overworked. Grace in all things is what I strive for. I just found out that two of my designs were in the Top Ten in Soft Flex Company's Steampunk-themed 2010 Flex Your Creativity Contest! I feel really honored! There were some really beautiful designs up against my own. A big THANK YOU to everyone who voted. As a way to express my gratitude and share the love, as soon as I get my prizes, I'm going to put the loot up in a giveaway. This week, one lucky winner will claim the prize of THREE collections of assorted lucite from the fine folks at the Oklahoma-based bead store, The Hole Bead Shoppe. Lucite is a wonderful material. It's lightweight, wallet-friendly, and vibrantly colored. It's ideal for earrings or for big statement pieces. You can go BIG without breaking your neck or breaking your budget! Lucite is also great, because it goes well with other materials and can easily be incorporated into your designs. I particularly like to use lucite with blingy Swarovski crystals or with matte-finish, tumbled beach glass. CLICK HERE to check out the vast array of lucite available from The Hole Bead Shoppe! To win these luscious lucite goodies from The Hole Bead Shoppe, all you have to do is leave a comment on this blog post. Couldn't be easier! One lucky winner will be randomly selected from the comment section of this post on Tuesday (December 21st) at midnight EST. (Happy Winter Solstice!) Please leave your name and contact information if it doesn't already appear next to your comment. This giveaway is open to all participants, including international readers! Bonus Points: Do you really want this awesome selection of candy-colored components? If so, you can earn additional entries by blogging, updating your Facebook page, and/or Twittering about this Thursday Giveaway. Don't forget to add your act of social media kindness as a SEPARATE comment to this blog post for your extra shot at these pretties. Extra Bonus Points: If you want another way to enter to win, head over to The Hole Bead Shoppe's blog, Blah, Blog, Blah some more, find the Follow widget on the right sidebar and become a follower! 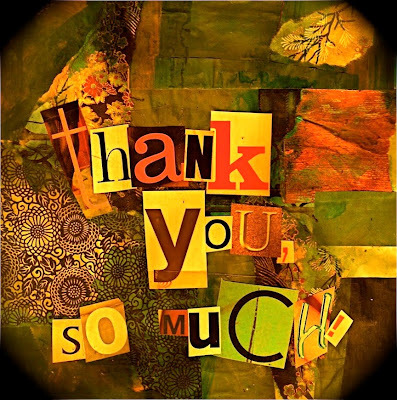 After you've successfully added yourself as a follower of The Hole Bead Shoppe's blog, leave a comment on this blog post saying so. CLICK HERE to visit The Hole Bead Shoppe's blog. I saw this deer wading through the snow from the window in my studio. I watched it trudge its way through the drifts, bounding gracefully. The deer usually keep their distance, but winter draws them closer. I could spend hours watching them. Admittedly, I spend more time watching them than I really should. It's a busy time of year. I wish I was one of those energetic people who plows through lists of things to do mechanically and methodically. I'm not one of those people... especially not in winter. Even with copious amounts of caffeine, I am much slower to cross things off my list. My brain is wired in a way that meanders and wanders. It does not help that it gets darker earlier. I feel the overwhelming urge to build a fort out of blankets and pillows and climb in with my two furry cats and hibernate. This, of course, is not possible. Too much to do and not enough time to do it in. I'll soon be leaving for Tucson and nothing is ready yet. I suppose I should just buckle down, draw the curtains and get to work. I imagine that if I keep chipping away at all the things I've slated for myself to do... eventually... little bits will start getting done. The winner for this past week's Thursday Giveaway featuring goodies from Cindy Gimbrone is Kym Hunter of Creatively Kym. Congrats! Send me your address and I'll pop it in the post! Be on the look on Thursday for another chance to win! When it snows outside, I do not leave the house unless I absolutely must. As beautiful as it is in its cold way, I prefer to be warm and dry. I enjoy looking out at the snow more than I like to be in it. From the window, I saw a family of deer pass through. I caught the stragglers in the picture above, but there were many more. The property we're on doesn't allow hunting, which makes it one of the few refuges in the area. While I was looking out the window, I noticed an intricate, lace-like pattern of frost on the windowpane – tiny, little, crystalline shapes branching out along the corners. I couldn't help but shiver when I saw these wintry things! Yesterday, the snow was almost completely gone. It had all melted save for a few patches where the snow had accumulated the most. I was delighted with the prospects of not having wet shoes or soggy hems. But then, in the night it started snowing and snowing and snowing – the kind of snow that likes to pile up. The driveway is completely obscured by snow. I can hardly make out where it is. It's almost as if the world outside has been swallowed up in winter white. Looking out the window, I wonder... was my day of dry shoes and pant legs a dream? 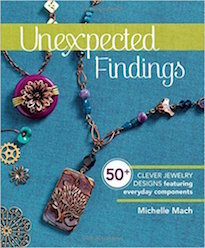 Cindy's been stamping metal and has some thoughtful things to say about Lisa Niven Kelly's book, "Stamped Metal Jewelry." I was talking with my father the other day. I asked him what he had been up to and he responded back with the typical answer: Working. He asked me what I had been up to and I told him that I had been working too. For some reason, I became frustrated and I didn't know why. 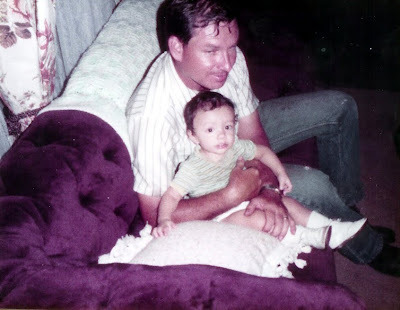 When I was growing up, I used to hate it when my dad said that he didn't have time for us. Too many times did we hear the words, "I'm too busy. I have to work." Now that I'm older, I can understand better the concepts of obligation and responsibility. I also think that work was a way for him to escape from us, his brood of children who didn't look very much like him and had wildly independent hearts and minds, children who escaped themselves into worlds of fantasy and make-believe. I vowed then to be different. To make time for those in my life who were important to me. I realized though that despite my best efforts, I was more like my father than I wanted to admit. I'm just as much of a workaholic as he is. It's true that my work is also my passion and that I am my most happiest when I'm making things, but there are times when I get swept up in what I'm doing and everything else falls away. It's my hope that when my work/life balance becomes unbalanced, that it'll do more than just be the means of survival and making a living, but will bring joy and beauty in other's lives. I hope that the sacrifices I make today, will enrich the lives of others and will ripple outward. This is my hope when I find myself entrenched in work. The days are busy with plans for the future. It's really thrilling. Kind of like standing on the edge of a cliff, with the bluest of blues stretching out infinitely before you and the warm light of dawn bathing your face, feeling connected and rooted to the magic of place and time. How exhilarating! Haven't experienced that? Well, you could. You too could be standing there. Plans are beginning to take shape for our future adventures: the Outer Banks in summer and Hawaii in fall and Tucson again in winter. I cannot begin to tell you how excited I am. There is so much to see and experience... so many future moments to capture. You might know Terri Windling as the accomplished author of The Wood Wife and editor of several mythic works of fiction. She is also a talented artist. 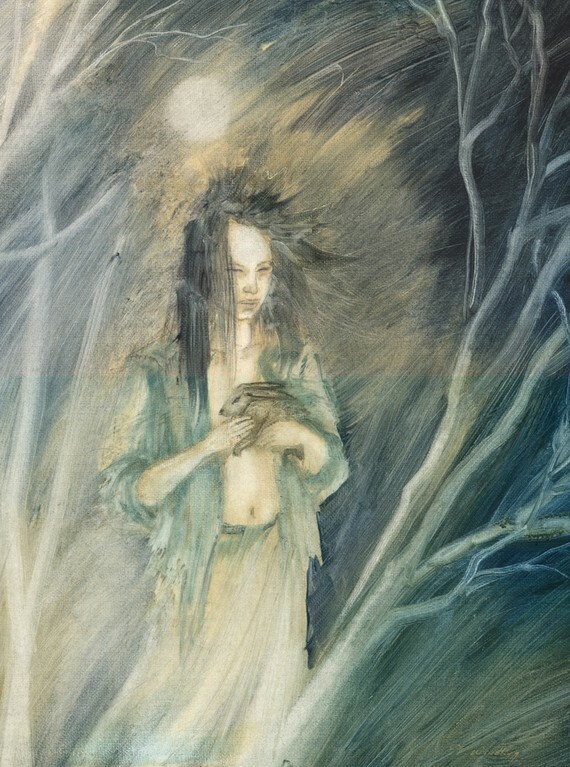 Her artwork, much like her writing, is full of enchantment and is strikingly poetic. Right now, signed prints like "Brother and Sister" (shown to the left) are available at a discounted price! CLICK HERE to check out the selection. This week, one lucky winner will score this treasure trove of components courtesy of the Lampwork Diva herself, Cindy Gimbrone! Up for grabs are two transparent green glass spirals, one Bling Link in silver and ivory, one Surreal Rhythms focal bead, one bronze Art Nouveau Stile Floreal Sunflower Connector, and one fine silver Victorian buckle connector. What a wonderful prize! Just think of all the possibilities! The glass spirals could easily be transformed into a pair of Christmas Tree holiday earrings. Attach two lengths of chain and a closure to the Bling Link and dangle bits of chain and some charms from the glass link focal for an elegant and modern necklace. Use the fine silver Victorian buckle component in a wire-wrapped ring or in a cute charm bracelet. What about attaching the bronze connector to a leather cuff for an edgy, yet feminine piece of jewelry? The Surreal Rhythms focal inspired by Surrealist art and Beatnik poet would look great strung up on a simple chain or at the end of a seed beaded spiral rope lariat. Really... the possibilities are endless! What I love about Cindy's underlining design principle is that she's not afraid to explore new materials and is constantly investigating new ways of doing things. Her work is vibrant with this ingenuity and one never knows what they'll come away with when they drop by her online shop. I think Cindy does a great job promoting the idea that inspiration can be found anywhere. Whether it's directly from art or from creative challenges, or various educational pursuits. Inspiration is everywhere. Discover a great degree at online accountants. One would be surprised by how art can be derived from an unlikely places. To win this lovely assortment of goodies from Cindy Gimbrone, all you have to do is leave a comment on this blog post. Couldn't be easier! One lucky winner will be randomly selected from the comment section of this post on Tuesday (December 14th) at midnight EST. Please leave your name and contact information if it doesn't already appear next to your comment. This giveaway is open to all participants, including international readers! Bonus Points: Do you really want this treasure trove of diverse offerings? If so, you can earn additional entries by blogging, updating your Facebook page, and/or Twittering about this Thursday Giveaway. Don't forget to add your act of social media kindness as a SEPARATE comment to this blog post for your extra shot at these pretties. Extra Bonus Points: Serious about winning? Why not earn an extra entry? Swing by the Cindy's website and take a look around. Report back here afterwards and leave a separate comment letting us know what catches your fancy and why! CLICK HERE to visit Cindy's website. EXTRA Extra Bonus Points: If you want another way to throw your hat in the ring for this assortment of artisan-made goods, head over to Cindy's blog, Lampwork Diva, find the Follow widget on the right sidebar and become a follower! After you've successfully added yourself as a follower of Cindy's blog, leave a comment on this blog post saying so. CLICK HERE to visit Cindy's blog.